JOSEP DE TOGORES (Sardañola del Vallés, Barcelona, 19 de julio de 1893- Barcelona, 17 de junio de 1970). Togores arrives to Paris in 1913. He’s a recognised painter in Barcelona. The First War made him come back to Barcelona and in 1919 he returns to Paris. In 1920 he met Kahnweiler and a year later he signs a contract with him. This relationship will last until 1931. In 1922 he has the first one individual exhibition, presented by Max Jacob, with a great success. The Togores’ works has always been divided in two antagonistic blocks: figurative-realist 1920-1927 and abstract–surrealist 1928-1931. When he ends his relation with Kahnweiler he returns to Barcelona forever. 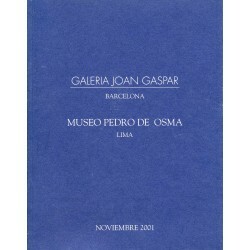 His works will be showed in Sala Parés and the Gallerias Joan Gaspar-Barcelona (1994-1995) and Madrid (2006). 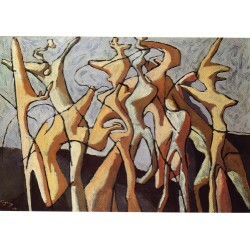 Art dealers as Albert Flechtheim in Düsseldorf, Germany and Kahnweiler in Paris, France make known his work as well as the André Masson, Henri Laurens, Gaston-Louis Roux and Elie Lascaux. Their work was published in prestigious Art Magazines and was exhibited in European capitals as well as in cities as Tokyo or New York. He had a good friendship with Aristides Mallol and Max Jacob. TOGORES Josep de There are 4 products. *** THE SHIPPING IS NOT INCLUDED IN THE PRICE, CONTACT US FOR MORE DETAILS ABOUT THE SHIPPING*** Original work Artist: Josep de Togores Title: "Figures" Year: 1930 Media: Oil on canvas Size: 81 x 116 cm. Attention! 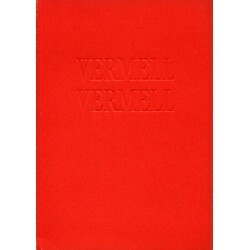 The colour that you see at you screen may vary from the original catalogue.